Hi team! I’m so excited to tell you about January. This was a really exciting month for us as we tried several experiments to still deliver lots of happiness during higher than ever volume. What a luxury that Buffer is growing so fast that we can barely keep up with customer emails! I was thrilled to share that Mary and Adam have completed their 45 day Buffer Bootcamp periods and have come on board with us full time! We also have a new Weekend Warrior starting. I can’t wait to see how this affects our stats and how well we are able to take care of people over the weekend and on Mondays. In January, we sent a total of 9771 replies, our highest volume ever and a 22% increase over December. Nice work team! Through these, we helped 5312 customers. *We use Help Scout, Spark Central, and Olark as our happiness delivering tools. We set and missed some ambitious goals, and are looking forward to trying some more experiments in February to get closer to hitting these. We had some fun getting creative with small changes we could make in order to better serve our customers. Scheduling time for each tool. The spike in volume after the New Year’s holiday resulted in several “code red” days, where our Happiness Heroes go into “beastmode” in the email inbox to try to get answers to folks who have been waiting. Unfortunately, this resulted in far less attention to Twitter and Live Chat than we like. So, in the first week of January, we started scheduling one hour for Twitter and one hour for live chat for each Happiness Hero per work day. This carried on through the month and resulted in better Twitter stats and a daily live chat presence. Sorting the inbox & not abandoning the “gravity” tickets. We noticed that a few of the older tickets that require developer attention and an investment of Happiness Hero time have been a bit neglected. We affectionally call these “gravity tickets” because they tend to sink to the bottom of the inbox as they get older and stop getting replies when we are stumped. In order to overcome this, we tested a very small change that actually had a large effect. That is, we sorted our Help Scout emails by oldest at the top (thus the oldest emails are the most visible) instead of newest at the top. This caused our “within 1 hour” metric to get much worse, but the older ones were not being left. We’re big believers in “managing your energy, not your time,” so we thought that having everyone jump into the tougher emails in the morning, when we’re most fresh, would be best. However, we found that we were able to make a bigger impact by diving into the newer emails first thing in the morning. This allowed us to “wow” some people who have emailed recently, as well as kick off the day in a super productive way, which inspires the rest of the day. With both methods of sorting, we got to the same inbox level by the end of the day, but we managed to make people far happier (including ourselves) by having one person at the top of the inbox, answering the newer questions, while the person who had been online for a few hours already (due to timezones) jumped to the older ones. Here are some stats to demonstrate just how inaccurate my initial hypothesis was! Result: Despite the fact that we had almost identical volume between Tuesday and Wednesday, the speed stats were far better on the day we had someone working from the newest emails as well as someone in the older ones. 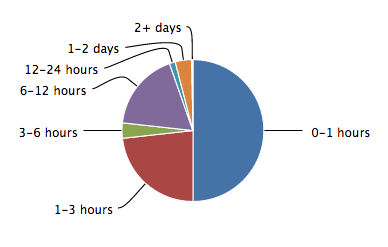 (For comparison, look at the “0-1 hour” percentage. Despite the fact that this was the wrong solution, we still felt strongly that we needed to better address the older emails. So, Joel and I started meeting a few times per week, roughly 30 minutes each, to go through any emails that hadn’t gotten a reply in the over 24 hours. This is a huge help and seems to be a success so far! Thanks, Joel! 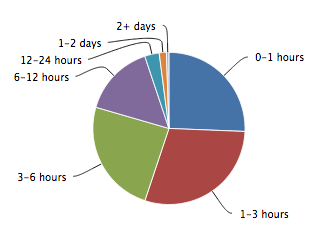 We’ll carry this on through February and see if we can nudge down the “over 24 hour” percentage. This month we also planned some specific times over the weekend when we’d all jump in. (This has been completely informal in the past; we usually check in at some point over the weekend but don’t have any specific goal or plan.) We first set a goal to do one hour each weekend day. We each did one day and failed to do the other day, which seemed like a strong signal to take one whole day off if possible. The following weekend, we each planned to do at least 2 hours on one day and take the other day totally off. This was far more successful. We also brought on our first “Weekend Warrior” at the very end of January, and can’t wait to see how this changes February’s report! We have always had a “bug board” in Trello in order to keep track of common bugs that are reported. This month, we gave it some more “oomph” and the Heroes recorded every single bug that was reported, even if we personally couldn’t reproduce it. This resulted in us noticing patterns faster and allowed us to better follow up if we fixed something. I’m keeping a closer eye on this board now and report the key bugs to our product team each week. Also, please let us know if there are any other numbers we can share or questions we can answer about our processes! I love to +1 this post(Buffer Open blog), but there is no +1 !! Hi Carolyn – extremely interesting read! Although I have far fewer requests from clients to help out, I face the similar dilemma with email: do I start by age of the email or difficulty? I found that as long as I pick a strategy and stick with it, I’m most happy, productive and produce the best work. Assuming all clients have similar deadlines and priorities, some days I want to knock out a bunch at once; but other times I want to spend time on the ones that I know are more difficult challenges. It depends on the cup of coffee I guess ;) Thanks again for putting this together! Have a great weekend.